We are in the Age of Information Overload: there’s just too much stuff going on in our lives and our attention span is stretched to the limit and beyond. Consider the Internet with the deluge of social media. Every nanosecond of our lives can now be documented and as soon as something happens anywhere in the world, we know about it instantaneously. Many of us are addicted to always being in the know, and whether it’s for work or pleasure, we are hooked and too often stressed. Go to a restaurant or any other public place and you’ll see people looking down, checking their cell phones for the latest update or email or Facebook posting. While we can all agree that technology has set us free, it’s also enslaved us with a monsoon of information that may or may not be pertinent to our lives. 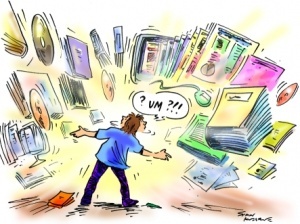 So this article Overcoming Information Overload by Margarita Tartakovsky, M.S. on the website PsychCentral.com is worth your time. It will help you with some common sense suggestions, such as scheduling breaks or limit access to information, so that the information storm in your life doesn’t lead to analysis paralysis where you can’t make a decision because there’s so much to filter out. We research these things for you at Novell and Novell so you don’t get overloaded.